taken for Vacation in Paris, an agency in New Jersey which offers short term rentals from $100 per night in a studio and up. 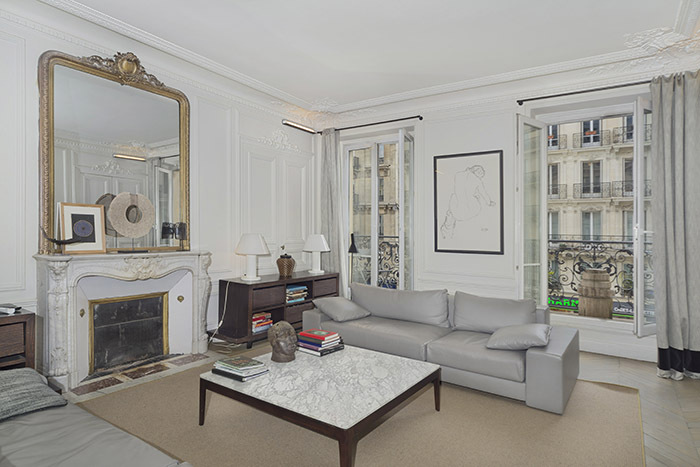 Refined Champs-Élysées two bedroom: Tall French windows, original herring bone parquet floors, chandeliers, wall moldings, Persian rugs and antique furniture blend to make up the distinction of this elegant home. The style reflects a typically Parisian home from the 1800s. 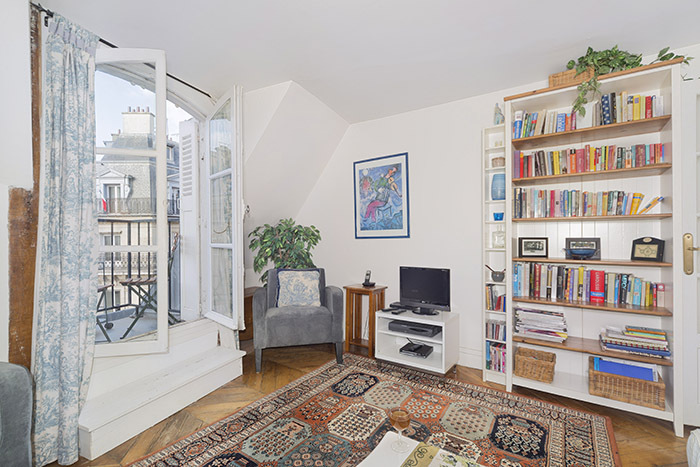 Charming Montmartre one bedroom: This charming apartment is located on beautiful rue Cavallotti, close to place de Clichy and the heart of Montmartre. Famous for its street artists, the beautiful Sacré-Cœur Basilica and the exciting Moulin Rouge, this neighborhood is brimming with charm and character. 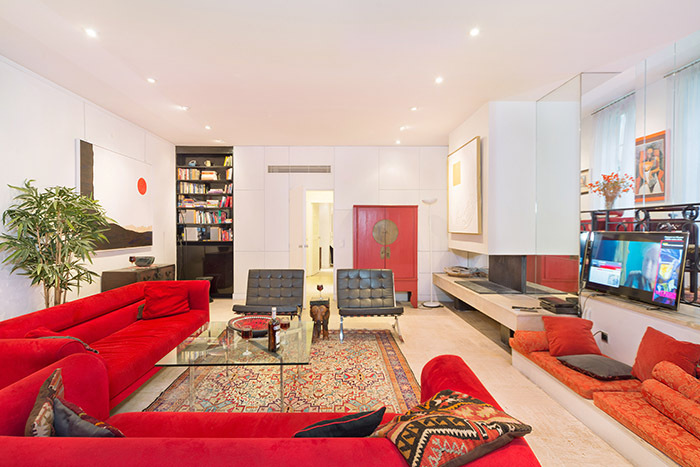 Grand Garnier three bedroom: The apartment is stunning; it resembles an in-town private mansion. The amount of space it offers is rare in Paris. With its floor-to-ceiling French windows, tall French mirrors over fireplaces, grey-washed hardwood floors, wall moldings and its contemporary photography throughout, this is an apartment with style. 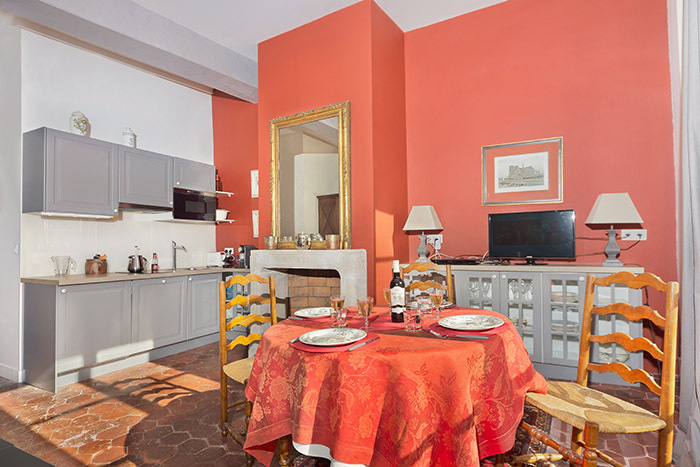 Lovely île Saint-Louis two bedroom: This apartment offers the refinement of an upscale home on one of the loveliest settings in Paris. Île Saint-Louis, an island separating the left and right banks, is easily accessible to many of the major sites in just minutes. Enjoy the beauty and calm of this exquisite location. 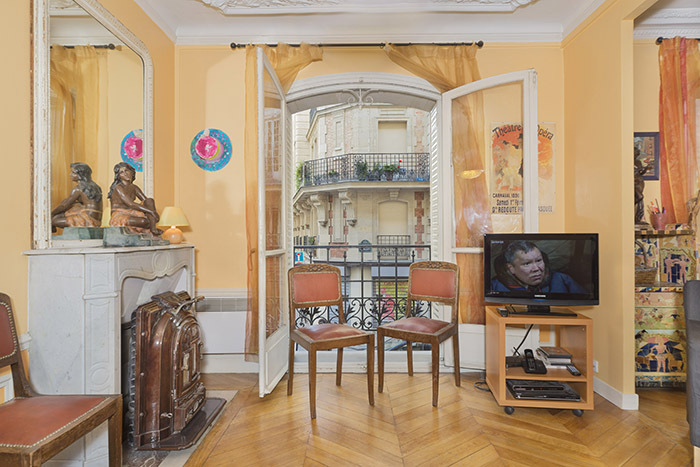 Louvre one bedroom apartment: This lovely one-bedroom apartment in a traditional Parisian building from 1832 was renovated in 2012 and has been rented with much guest praise ever since. 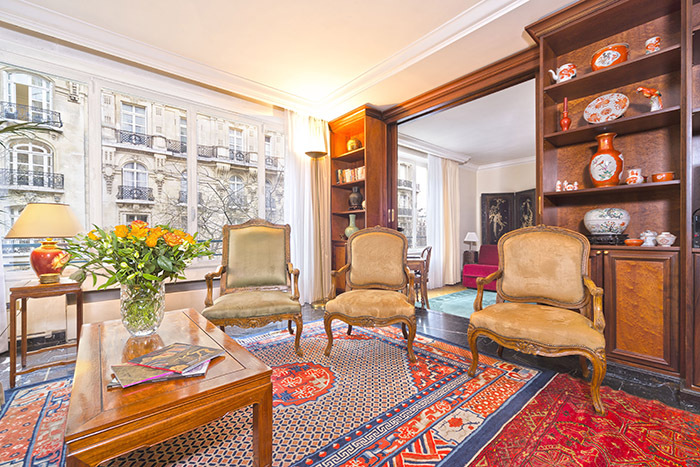 Elegant & spacious Marais two bedroom: If you’re looking for a holiday apartment in the center of Paris, which is quiet and comfortable, this is it! This large and spacious apartment offers high ceilings and an over sized living room to really spread out. This is a grand old building, with huge wooden entry doors and an inside staircase that has been declared a historical monument. Victor Hugo luxury two bedroom: Elegant residential location near l’étoile Charles de Gaulle, the Champs-Élysées and Trocadéro. Enjoy the nearby stylish shops and specialty stores along avenue Victor Hugo. 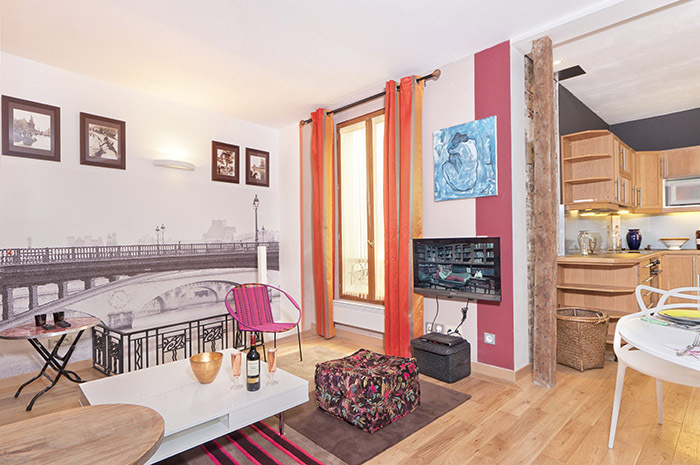 Pied-à-terre near Saint-Germain: This large one-bedroom is very creatively decorated, evoking a Parisian street scene, with animated city views painted on the walls as decorative background. It’s a fun place and very comfortable as well! 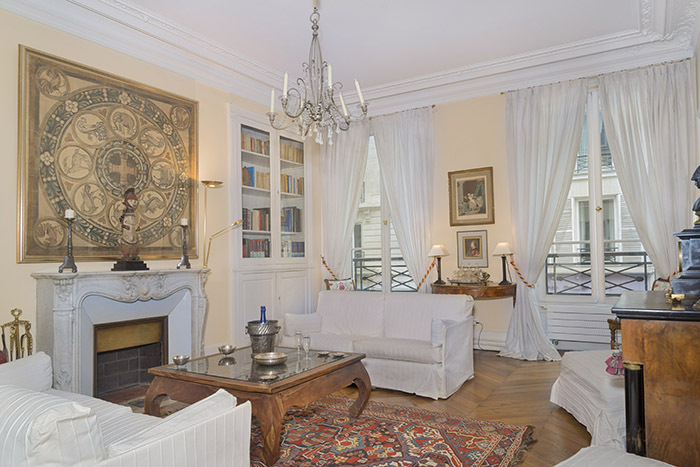 Luxembourg Gardens two bedroom splendor with air conditioning! Great studio in the upper Marais! Move Over Monet! : A charming atelier in the heart of the 7th! Arc de Triomphe with views!